If there is a movie that can be claimed as the one that put actors Lee Byung-hun, Song Kang-ho, and director Park Chan-wook on the proverbial map in a big way then it would have to be this one. In 2000 neither of these talented gentlemen had much on their resume. 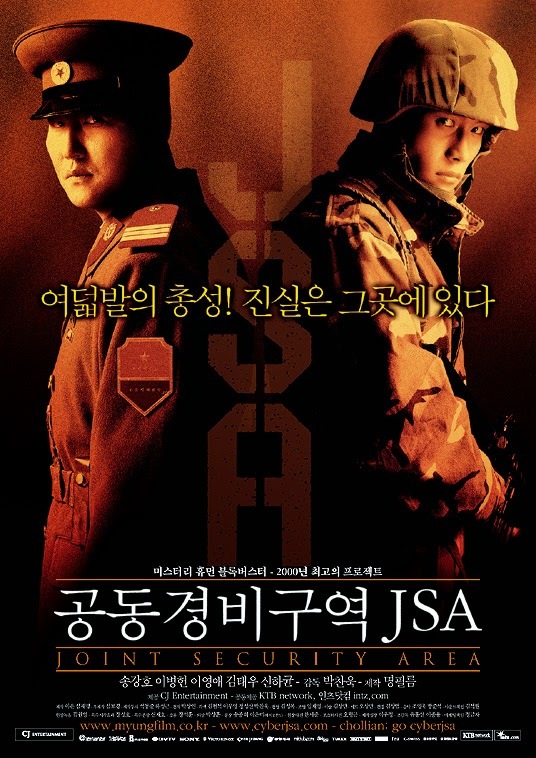 I imagine there was no reason to think that a movie about a murder on the demilitarized zone (aka the JSA) between North and South Korea would really flip that switch for them. There are a ton of South Korean flicks about the conflict with North Korea, after all. What makes this one so damn good? Well, talent, like time and tide, cannot be denied for long. Lee Byung-hun isn't quite as polished as he would be in later movies, but here he plays South Korean soldier Sergeant Lee Soo-hyeok, the suspect of a controversial murder, quite well. It is a relatively quiet performance compared to some of his later movies, but his character is undeniably sympathetic and he becomes much more alive and warm as the story goes on. His role is the perfect foil to that of Song Kang-ho who portrays the much louder and colder North Korean soldier Sergeant Oh Kyeong-pil. Song Kang-ho is like a chameleon when it comes to movies. Everytime I see him he is completely different because he just becomes the character so well. He really is like a Korean Gary Oldman. This actor combo really pushes this movie a great heights. The two of them had a conflict in a room on the north side of the JSA and this conflict left two North Korean soldiers dead and both of them injured. Afterwards North Korea and South Korea seem to be on the brink of war so a neutral investigation team is sent in to soothe the bitterness and find out just what really happened. The North is claiming that the South invaded with intent to kill while the South is claiming that the North kidnapped one of their men and he merely defended himself. Swiss Army Major Sophie E. Jean (Young-ae Lee) thinks there may be more to the whole thing than just political intrigue or underhanded military tactics and is determined to find out the mystery. How did a South Korean soldier end up in the north side of the JSA and how did those two North Korean soldiers meet their demise? Park Chan-wook deserves all the praise in the world for his direction. The guy is the Korean Quentin Tarantino. There's also shades of Hitchcock. The guy has a natural wow factor about him and he could not have had a better cast of lesser known (at the time) actors or story to work with. It was the perfect storm. I'm used to many twists and turns from the Korean world by now, but I didn't quite see this one coming. I highly recommend this one. I watched mine on a DVD that I ordered from YesAsia.com.